Before I arrived at the DMA, I wasn’t quite sure what my daily tasks as the McDermott Intern for African Art would entail. 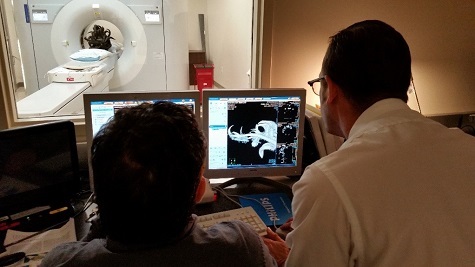 I certainly never expected to be sitting in on a biomedical engineering lecture at UT Southwestern studying a CT scan—but this was no ordinary CT scan: it was a scan of the DMA’s helmet mask (komo) from the Senufo peoples of Côte d’Ivoire. The purpose of this scan was to discover the contents of the horns that decorate the mask, as well as any other ritual materials that may have been placed within the structure. 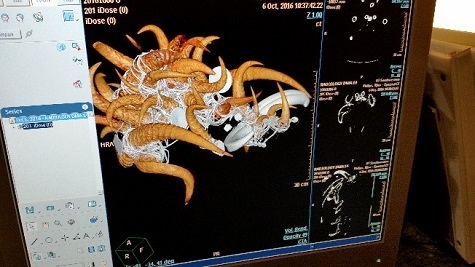 The scan showed the horns contained many small objects, including animal jaws and a variety of organic matter. With this information in hand, I hit the books in an attempt to understand why these objects would be chosen for use in a mask such as this one. As the Komo society is a secret knowledge society, details of masking traditions are not frequently shared; however, I was able to compile some information from Boureima T. Diamitani, scholar and Komo society member, to help contextualize the mask and the mysterious contents of its horns. The komo is believed to be a spirit above humans who possesses supernatural powers and is sent by God (Kle) to protect members of the secretive Komo society. The komo performs a masquerade that today functions as both a divination ritual and a form of entertainment. The origin of the Komo society is found in a story in which a hunter and his dog encountered and killed a frightening beast in the forest. The hunter brought the beast’s head back to the village to entertain the townspeople, thus becoming the first komotigui, or owner of the Komo. The mask form is taken from the appearance of the beast killed by the hunter. Today, the mask is most often worn during performances by the son of the komotigui or the son of the blacksmith who carved it. Blacksmiths carve komo masks from one piece of bugusulu softwood, a tree used exclusively for this purpose. As females and uninitiated males are not permitted to see the mask, the blacksmith must himself be a member of the Komo society and must carve the mask in the forest, out of sight of the village. The mask, carved over the course of three days, is sculpted with small wooden horns, which are then fitted with animal horns. The choice to carve the mask with horns is an important one: since relatively few animals have horns, the addition of horns emphasizes the strangeness and power associated with this creature. Upon completion, the carver relinquishes all responsibilities for the mask to the new komotigui, who may choose to add porcupine quills, more horns, feathers, or any other element he chooses; these additions distinguish particular masks from one another. A competitive spirit between komotiguis is a catalyst for artistic production and the various styles of many komo masks. Due to the personal preference involved in decorating the mask, we cannot be sure of the significance of each element that was found in the horns. 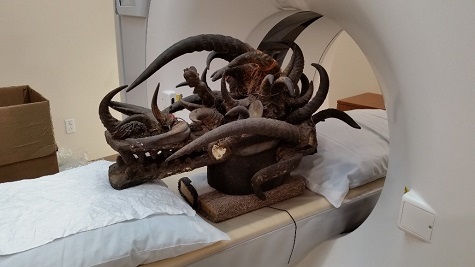 Many komotiguis chose to place powerful substances such as medicine or poison inside of the horns due to the aggressiveness and fear associated with them. 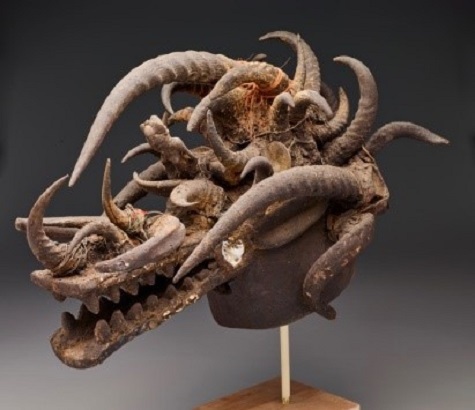 This implies that the substances that filled the horns likely held some type of ritual significance to Komo society members and were believed to increase the potency of the Komo society as well as the mask itself. Although we do not yet have all of the answers regarding the materials contained in this mask, or the reason that each specific item was chosen, we are on our way to a better understanding of the context of this mask’s creation. Further, this experience has immensely broadened my outlook on the ways in which science, technology, and the arts can work together to draw important cultural conclusions. Megan Zembower is the McDermott Intern for African Art at the DMA. Diamitani, Boureima Tiekoroni. 1999. Identities, Komo Societies, and Art Among the Tagwa Senufo of Burkina Faso (Doctoral Dissertation). Diamitani, Boureima T. “The Insider and the Ethnography of Secrecy: Challenges of Collecting Data on the Fearful Komo of the Tagwa-Senufo.” The African Archaeological Review 28, no. 1 (2011): 55-70. Diamitani, Boureima Tiékoroni. “Observing Komo among Tagwa People in Burkina Faso: A Burkinabe Art Historian’s Views.” African Arts 41, no. 3 (2008): 14-25. Thank you for such an informative and interesting article.